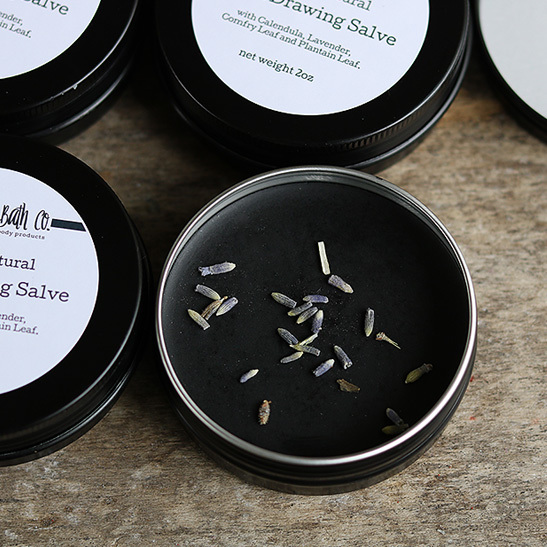 Black drawing salve – Salted Rock Bath Co.
Herbal salves have been around for centuries. They are 100% all natural and thought to aid a variety of skin conditions, muscle soreness, stuffy noses, and minor scrapes, burns and bruises. 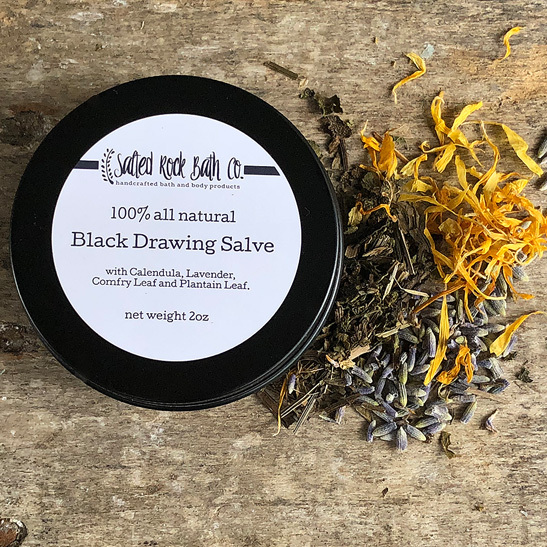 Black Drawing Salves are made with ingredients thought to help draw out toxins and other elements stuck within the skin. Many people use this for splinters, and some even claim it will remove venom from spider bites. Although it is black as night due to the activated charcoal, it will not stain the skin. A few of the beneficial ingredients in this salve are, unrefined shea butter, vitamin E, activated charcoal, kaolin clay, and olive oil infused with plantain leaves, calendula and comfrey leaves. It’s scented with pure lavender essential oil, which is also thought to be a wonderful tool in natural skincare. Black Drawing Salves are made with ingredients thought to help draw out toxins and other elements stuck within the skin. Many people use this for splinters, and some even claim it will remove venom from spider bites. Although it is black as night due to the activated charcoal, it will not stain the skin. A few of the beneficial ingredients in this salve are, unrefined shea butter, vitamin E, Raw Honey, activated charcoal, kaolin clay, and olive oil infused with plantain leaves, calendula and comfrey leaves. It’s scented with pure lavender essential oil, which is also thought to be a wonderful tool in natural skincare. Directions: Clean skin well before applying. Apply salve affected area of skin, then apply a band aid that is large enough to cover the entire area that has salve on it. Leave on 4-24 hours. Bigger elements may take longer and several applications before you see a difference. Please note that while all natural salves are a wonderful and natural way to treat ailments, they are not a replacement for medical care. Please talk with your doctor before using if you have any concerns. Vitamin E: Very strong anti-oxidant. Works to block free radicals from our skin which means less wrinkles and youthful looking skin. Coconut Oil: Naturally antibacterial and antifungal, coconut oil is an excellent moisturizer for skin. Activated Charcoal: Thought to detoxify by drawing toxins from body & skin. Raw Honey:Helps hydrate, tone, and fight acne. It is known as a humectant which means it attracts and seals moisture within your skin.Thought to add a glow to skin making it look younger and healthier. Full of antioxidants.